Swedish Touch Peonies Welcomes You!! As a wholesale Peony grower, we have built our reputation by growing quality roots at affordable prices. AS ALWAYS....WE THANK YOU FOR YOUR BUSINESS AND FOR LOOKING!!! All orders must be paid ( in full) within the 30 day net terms (or the quantity discount will not apply ) The quantity discount will not apply to any other special pricing we may be offering. Get your order placed, as we fill them on a first come, first serve basis. As most of you know, until we get each variety cut, we can only estimate what we will have in numbers. We try to be conservative when we take orders, so we do not oversell. We will let you know ASAP if there is a change in your request, and let you know what options you may have. 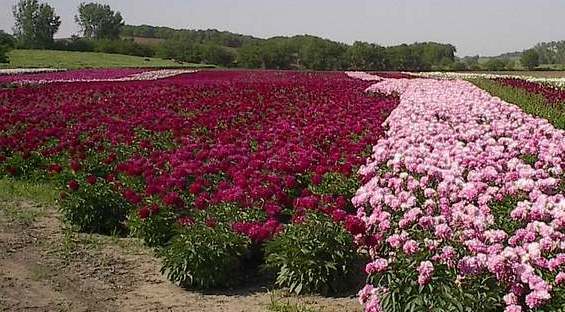 Operated by owners Vicki and Eric Sjulin, Swedish Touch Peonies is located in the beautiful Loess Hills of Southwest Iowa. We are just off I-29, approximately 50 miles south of the Omaha/Council Bluffs area. If you’re looking for skilled, family owned and run, peony growers, we have exactly what you need. The type of soil we use in growing our plants is called loess (pronounced luss), a German word meaning crumbly. The soil consists of a gritty, light-weight material composed of tightly packed grains of quartz, feldspar, mica, other minerals. Our unique soil and location give us a major advantage in growing quality plants, as peonies thrive in this type of environment. Our Loess Hills extend from the southwest to northwest tip of Iowa. Wind formed the bluffs over 25,000 years ago, and the only other place like it in the world is near China’s Yellow River. We are a third generation of Sjulins, involved with a long history in the nursery business dating back to the early 1900's. As such, we are very knowledgeable with what we grow and we pride ourselves in offering many of the selections our Grandfather grew decades ago; some he even named himself! During the blooming season, we practically live in our fields in order to provide cut flowers for the Omaha and Lincoln markets ( we’ve been doing this for the last 25 years.) This also enables us to recognize growth habits, dig mixes, get counts, and indulge in the tranquility, beauty, and fragrance of our peony fields! Take a look at the peony varieties currently available in our online catalogue. As our inventory changes, we will try to keep the site updated, however, in the event you request something "sold out" we will contact you with options, and will not substitute without your approval. When you place an order, you will be dealing directly with Eric or Vicki; so there is a contact person to take full accountability. The two of us do the majority of the work, with help from Vic's parents. We try to return calls, faxes, and e-mails as they come in.